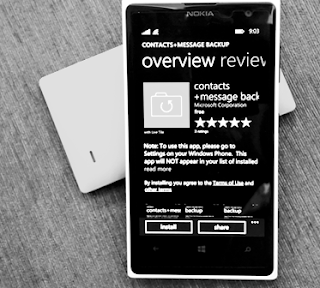 You are Lumia Windows Phone 8.1 users who have an external memory or SD-Card is now able to perform backup phonebook, SMS and MMS you to external memory using the system application "contacts + message backup" of Microsoft today (25/04) officially released. Later, if you have already downloaded "message backup contacts +", then the options / settings menu will appear in a new menu called "contacts + message backup". Thus, it should be known that the application system will not appear in the application list or in the main screen. 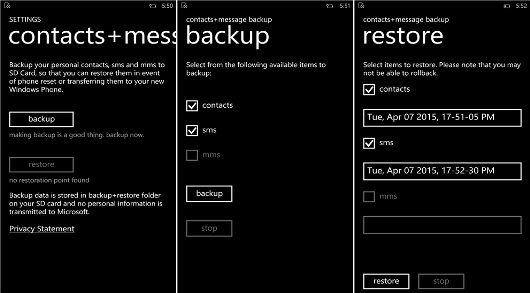 "contacts + message backup" will be able to make backups of all the phone book, SMS and MMS along with attachments that you have and will be stored in external memory / SD-Card in the folder "backup + restore". The format used for backup result is a list of telephone VCF format. While the for SMS and MMS using the XML format. Later, you can restore all the phonebook, SMS and MMS to Lumia Windows Phone 8.1 are the same or different by using the results of the backup file. Keep in mind, the current application system "contacts + message backup" only supports Lumia Windows Phone 8.1 which has an external memory slot / SD-CARD. If you do not have a slot Lumia external memory / SD-CARD, it will be useless if you do download this application because the system can not be used.